These soft, chewy, creamy caramels are made with organic coconut milk for added richness to give you sweet delight in every bite! With the perfect hint of sea salt, these caramels are very reminiscent of those bulk bin caramel squares you may remember from your pre-vegan days, but of course, these are 100% animal-free and are definitely delicious. Each 6 oz. 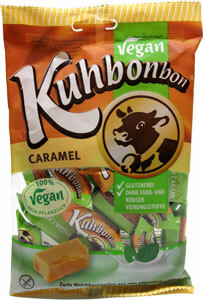 (168g) package contains 14 individually wrapped chewy caramels. Imported from Europe. $5.99 per package.